Right: This artwork is an early draft of the CD cover for Al’s new single, to be offered exclusively online. 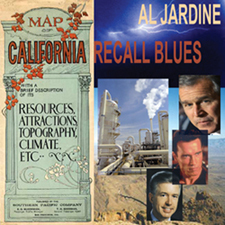 Be sure to check Jardine’s website, AlJardine.com. E.C. : Why did you record “California Recall Blues”? Al Jardine: As you remember, in 2001, we had our first energy crisis, in terms of shortages. It paralyzed the system here in California. We actually had rolling blackouts across the state. It’s been all downhill ever since, because of Governor Davis’ inability to find solutions to the problem. I doubt that anybody could have foreseen the kind of impact that it’s had. What can you do? What can Arnold Schwarzenegger do? What could you or I do about it? Not much. Usually there’s someone who has to take the fall; in this case it’s Davis. The energy policy dictates the cost of energy in California, and across this country for that matter. The higher rate increases are an indication that we need to change the way we govern. It’s a coup by the GOP to grab the governorship to California to make this place a safe haven for George W. Bush in 2004. It’s incredible when you think about it. The recall cost the state $100 million. Governing the state is going to be hard work. I don’t know if Schwarzenegger is up to that. I think our society out here has become excessive in the way we spend too much money. E.C. : What did you do differently on the new version that’s different? Al Jardine: I made lyrical changes, added an extra verse, added Gray Davis’ name as well as a voice-over of Arnold Schwarzenegger’s voice. We used Pro Tools and surgically moved things around. It’s really a period piece, because the election is over. ESQ Editor’s Note: The new version has additional lyrics, but it still has the jazz flavoring the original has. This song is completely built around a 1-2 beat that is unlike anything that Jardine had recorded prior to 2001. Just as the late Dennis and Carl Wilson have musically done in the past, Al continues to explore his roots without limiting his composing style and vision. Al Jardine interview from Fall/Winter issue of ESQ [copyright 2003]: reprinted by permission. The new issue of Endless Summer Quarterly, due in March will feature coverage of the Dennis Wilson Bash and an exclusive accompanying ESQ CD featuring new music from: Billy Hinsche; Scott Bennett with Brian Wilson, Nick Walusko and Jeff Foskett; Stephen Kalinich; Al Jardine; David Marks; Alan Boyd and Friends; The Olive Branch; Justyn and Carl B. Wilson; Carl B. Wilson; Sleeping Giant (featuring Dennis Diken of The Smithereens); POPGEMS; Gary Griffin and Jeff Foskett; SPIHUNT; Mitch Schecter and Ken Bryan. The issue and CD are exclusively available to DW Bash attendees and subscribers only.